Directed by Ellis R Dungan, the biopic of the 16th century saint was a huge success both in Tamil and the Hindi remake. Carnatic legend MS Subbulakshmi also had a brief but noteworthy movie career – she headlined five films, of which Ellis R Dungan directed three. 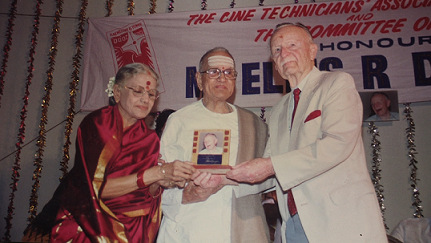 The American national, who was one of the pioneers of early Tamil cinema, directed Subbulakshmi in Sakuntalai (1940), Meera (1945) in Tamil and its Hindi version of the same name, made in 1947. Film historians consider Meera to be Subbulakshmi’s best ever performance. Ellis R Dungan directing ‘Meera’. Courtesy West Virginia State Archives, USA. 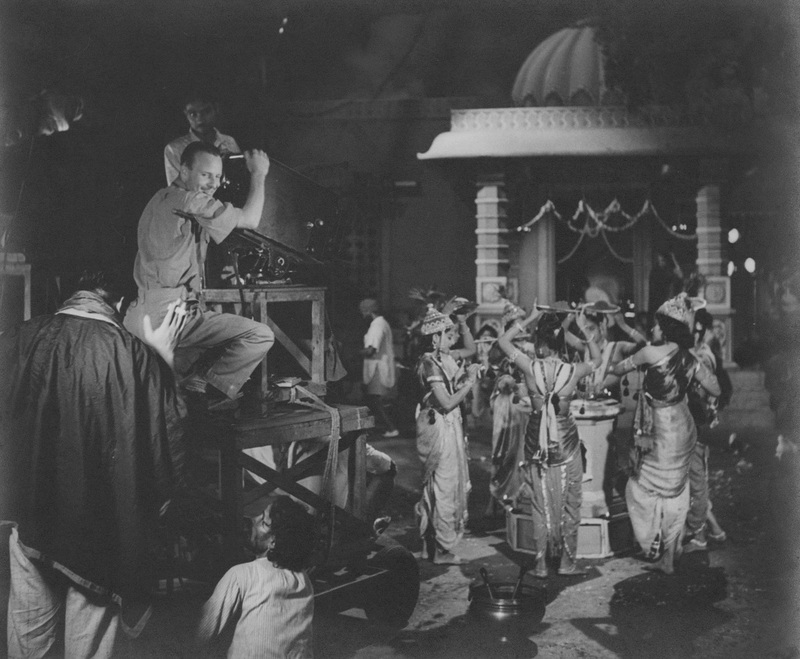 Though Dungan had cut down on his feature film work during World War II and signed up as the official photographer of the Madras government, he jumped at the offer to direct Meera. After all, the movie reunited him with his good friends MS and her husband Sadasivam after their highly regarded previous effort, Sakuntalai. Once on board, Dungan began his work by getting a written version of the script and breaking it down into scenes and shots – in other words, creating a shooting script, something he pioneered in Tamil cinema. This meant detailing the action on the left half of the page and matching it with corresponding dialogue on the right side. Dungan got each scene translated from Tamil into English and then leave Chennai (then Madras) for a month or two to work on the script. For Meera, Dungan stayed in Coonoor for a month in a cottage set up with a cook and domestic help for him by Sadasivam. MS and Sadasivam would drop in on Sundays to check on the script, take back the material that was ready, and get it typed up in English. 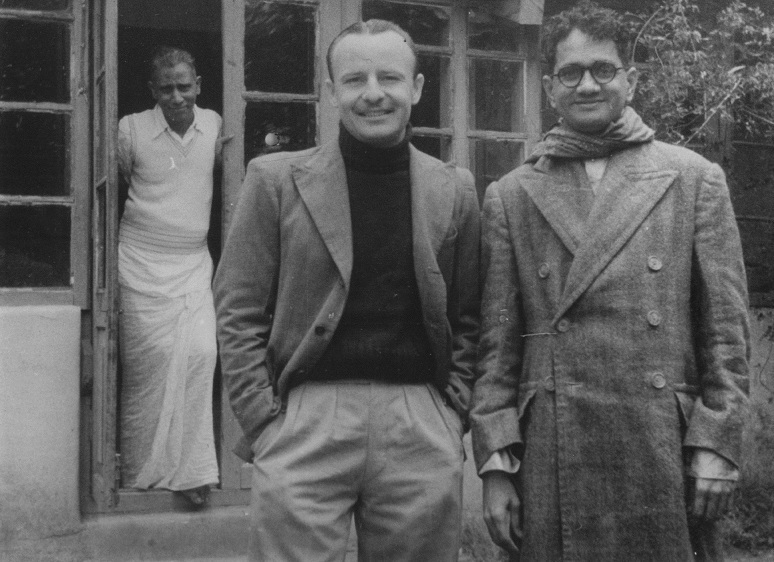 Ellis R Dungan and T Sadasivam. Courtesy Radha Viswanathan. Before filming began for Meera, Dungan and his cinematographer, Jiten Banerjee, did a series of elaborate lighting tests on a specially created bust of MS. They shot the bust using different camera heights and angles with varied lighting schemes. They then studied the developed rushes to decide what worked best for Subbulakshmi’s face structure. Little wonder, then, that she looks absolutely ethereal in the film. A particular scene highlighting her eyes was a favourite of Dungan’s. “MS had beautiful large eyes and I wanted to highlight them during one of her songs. I used a special lighting with equipment I’d brought with me from the US and isolated the areas of her eyes with two “gobos” – one at the top of her eyes and one underneath – and feathered the edges of the gobos by putting a diffusion screen on the top and bottom edges to soften them… … It was a beautiful effect,” he writes in his memoir. Dungan’s approach papers over the singer’s relative lack of professional acting experience. He treats the story as a prop to lead into her numerous songs wherever possible. Here of course, MS is in divine form and responds beautifully to each and every track. ‘Katrinile Varun Geetham’ from ‘Meera’ (1945). Meera began production first at Studio Newtone in Chennai before moving on to North India – Rajasthan in particular – for on-location filming. Radha Viswanathan, Subbulakshmi’s daughter, who played the young Meera in the film, remembers that crowds thronged the shoot wherever MS was present. According to her, some fans believed that Subbulakshmi was Meera reincarnated. 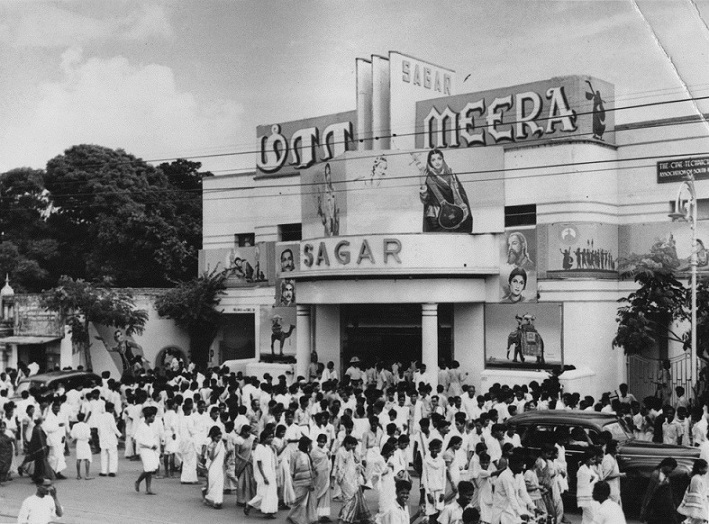 A ‘Meera’ show at Sagar Theatre in Chennai. Courtesy Radha Viswanathan. Meera had a Diwali release in 1945 and was a huge box office success. Its popularity led Sadasivam to ambitiously attempt a Hindi version. And cherished she was. The huge success of the Hindi version led to Subbulakshmi becoming a household name all over the country. Many saw her as the embodiment of the saint. Meera proved to be the ideal swansong to Subbulakshmi’s acting career. After the Hindi release, she concentrated on her music. 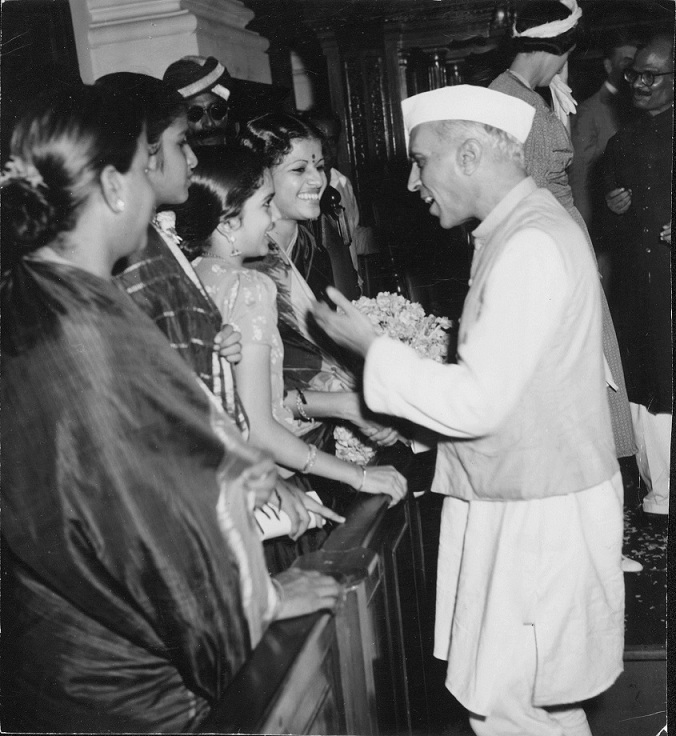 Jawaharlal Nehru with MS Subbulakshmi in 1947. Courtesy West Virginia State Archives, USA. The 1994 function. Courtesy Rochelle Shah. Karan Bali is the co-founder of the website Upperstall, the director of the documentary An American in Madras, and a contributor to Scroll.in.